Bob Tisdale is one of the pseudo-scientists who frequently writes articles for Anthony Watts' climate conspiracy blog, WUWT. His articles are often overly long, overly tedious and overly wrong. He is also a greenhouse effect denier. He thinks that it's the sun that's causing global warming through El Ninos and blobs. He's wrong. Bob's what you'd might regard as a plodder. Not a quick-witted chap. He's not a research scientist and has never boasted of any educational qualifications. Where his expertise lies, if you can call it that, is in regurgitating the same mix of pseudo-science tinged now and again with real science - over and over and over again. 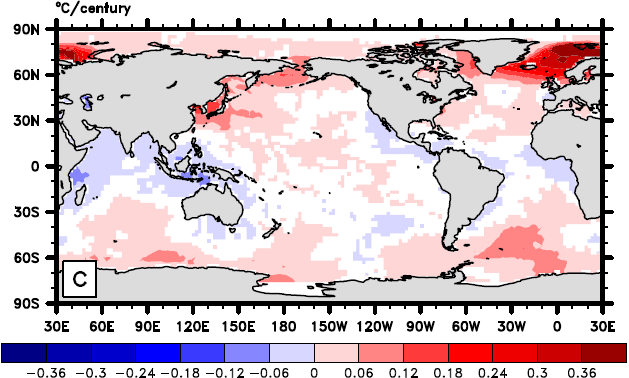 Bob's usual subject is ENSO, with occasional forays into sea surface temperature in general. Hunched over his keyboard, he relies on the years of difficult and arduous field work, clear thinking and clever, complicated analysis from scientists, but he despises their efforts in true denier fashion. He doesn't understand most of it so he cranks out his sunlight fueled nonsense and some deniers lap it up. 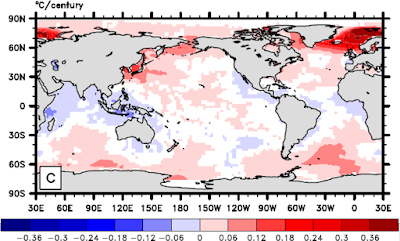 Bob's latest beef is with the global sea surface temperature (archived here). He's got a bee in his bonnet about the new version of the Extended Reconstructed Sea Surface Temperature ERSST version 4. Bob has inadvertently or deliberately misrepresented the work - probably a bit of both. Sea surface temperature is measured by observations taken on ships as well as buoys. (Also from satellites - but not ERSST v4.) The ships have changed over time as has the way temperature is taken - a lot. So to get a set of data that is consistent over decades, scientists have to make all sorts of correcting adjustments, using fancy algorithms. As described in one of the main ERSSTv4 papers, Huang15, in ERSSTv4 there were two main bias adjustments. One to adjust bias in ship SSTs over time - using HadNMAT2; and one to adjust for bias between the ship and buoy SSTs. Bob Tisdale only focused on the former, which constitute only 10% of the measurements in the period post-1980. NOAA used the night marine air temperature dataset (HADNMAT2) from the UK Met office as a reference for their new ERSST.v4 dataset. But the short-term warming rate of the new NOAA ERSST.v4 data during the global warming slowdown is much higher than the HADNMAT2 data. See Figure 1, which was first presented in my open letter to Tom Karl. 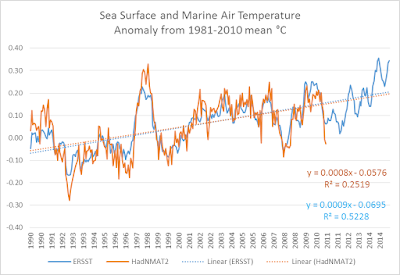 That graph serves as the basis for my statements (1) that the recent update to the NOAA sea surface temperature data cannot be justified by the dataset that was used a reference for those adjustments, and, in turn, (2) that the NOAA adjustments are overcooked. ... ship SST measurements are adjusted through reference to the most recent night time marine air temperatures (NMAT) from the Hadley Centre. When the NOAA researchers set out to get an more accurate reconstruction of ship sea surface temperatures, they looked at the night time marine air temperature (not sea surface temperature) as reconstructed in a special data set, the Hadley Centre night time marine air temperature data set or HadNMAT2. That allowed them to correct for bias in ship data, which was the first step they took after quality control. Observations from buoys are more accurate and more consistent than those from ships. So the scientists also looked to where ships and buoys were co-located, which enabled them to make further corrections to the data. Bob's article wasn't about this aspect. He was only concerned with the first lot of bias adjustments I mentioned. The ones to correct a bias in ship sea surface temperature by using HadNMAT. You'd not know how much work went into ERSST v4 if you only read WUWT. If you relied on quacks like Bob Tisdale, you'd probably think that getting sea surface temperatures is a piece of cake. You'd think that all you had to do was go to the Hadley Centre in the UK and ask them to give you the Hadley Centre Nighttime Marine Air Temperatures (NMAT) and that would be that. It wouldn't matter what the daytime marine air temperatures were. Nor would it matter what the temperature of the sea surface was. Nor that these night time observations can be quite sparse. All you'd have to do is go to KNMI Climate Explorer, grab some data (collected over decades, and developed through years of painstaking work by scientists) and plot the temperature of the air about ten metres or so above the sea surface and you'd have your answer. Thing is, you'd be as wrong as Bob Tisdale. Bob thinks that every observation in ERSST v4 was adjusted to match HadNMAT2. Or he thinks that they should have been. He's wrong of course. There are papers describing how NMAT was used. It was used to work out the bias in ship observations, not all the observations combined. The SSTs from ships or buoys were accepted (rejected) under a QC criterion that observed SSTs differ from the first-guess SST [sea surface temperature] from ERSST.v3b by less (more) than 4 times standard deviation (STD) of SST (Smith and Reynolds 2003). 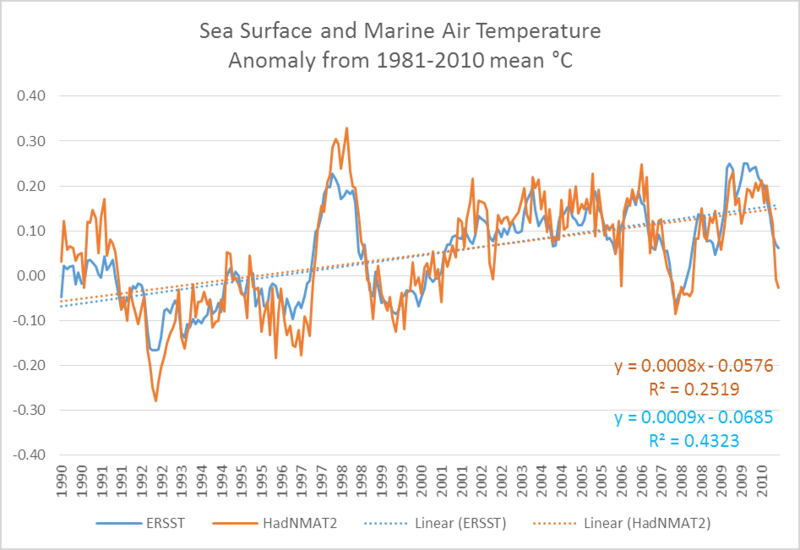 The ship and buoy SSTs that have passed QC were then converted into SSTAs [sea surface temperature anomalies] by subtracting the SST climatology (1971–2000) at their in situ locations in monthly resolution. The ship SSTA was adjusted based on the NMAT comparators; buoy SSTA was adjusted by a mean difference of 0.12°C between ship and buoy observations (section 5). The ship and buoy SSTAs were merged and bin-averaged into monthly ‘‘superobservations’’ on a 2° x 2° grid. The latest release of Hadley NMAT version 2 (HadNMAT2) from 1856 to 2010 (Kent et al. 2013) provided better quality-controlled NMAT, which includes adjustments for increased ship deck height, removal of artifacts, and increased spatial coverage due to added records. 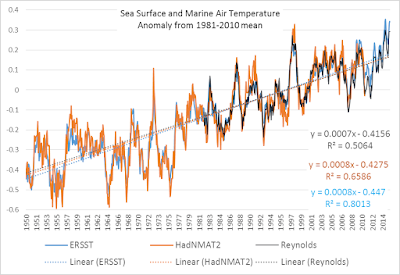 These NMAT data are better suited to identifying SST biases in ERSST, and therefore the bias adjustments in ERSST version 4 (ERSST.v4) have been estimated throughout the period of record instead of exclusively to account for pre-1941 biases as in v3b. Since 1980 the global marine observations have gone from a mix of roughly 10% buoys and 90% ship-based measurements to 90% buoys and 10% ship measurements (Kennedy et al. 2011). So that means that the HadMNAT2 adjustments only applied to 10% of the observations. The other 90% of data comes from buoys. So when Bob puts up his chart showing that NMAT observations have a different slope from the slope of ERSST v4, he's not demonstrating that ERSST v4 is wrong. In the period that Bob was most interested in, only about 10% of the observations are affected by the bias adjustment with HadNMAT. There's more. I was advised by one of the researchers that where both ships and buoys exist, the algorithms give buoys more than six times the weighting given to ship data. That means that over the last twenty thirty five years of ERSST v4, the results are dominated by data from buoys. What that illustrates is that Bob is wrong if he thinks that the bias adjustment algorithm (using HadNMAT2) has an equal effect across the board. Obviously it doesn't, or there wouldn't have been these regional differences appearing when a different set of marine air temperatures was used for bias adjustment. When the HadNMAT2 bias correction is applied there is a ripple effect that can have different impacts in different regions. 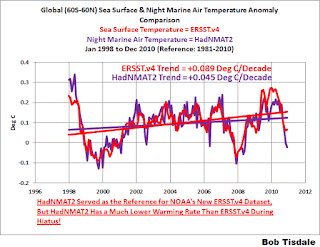 Bob and his silly graphs claiming 0.04C/decade is "much different"! First of all let's clear things up. Bob's ERSSTv4 line has almost no influence from the HadNMAT bias adjusting algorithm. That's because most of the data is from buoys, not ships. And as I wrote above, where ships and buoys both exist, the buoys have six times more weighting. So he's not showing what he thinks he's showing. If he could extract it, he should be comparing the less than 10% of the data that comes from ships with his HadNMAT plot, not the full ERSSTv4. Put that to one side, what about his claim that the two charts are not a good match. Well I disagree. Not only are the values very closely matched (the lines overlap for most of the period he shows), but the difference in the trend is minor. 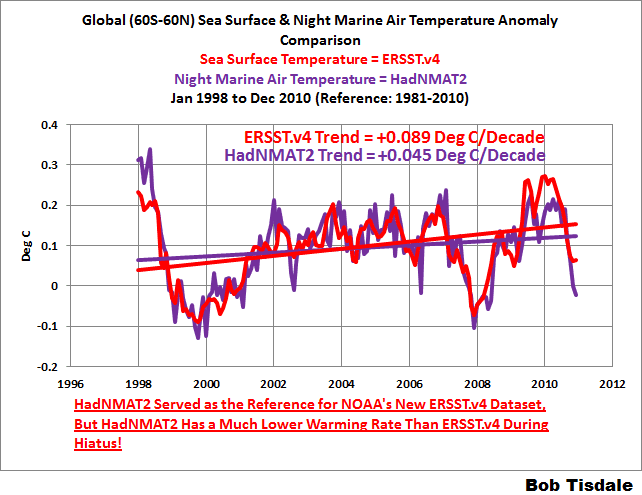 Bob calls HadNMAT2 a "much lower rate" - yeah, all of 0.04C/decade difference! And below is the chart from 1950 to 2015. I've added in Reynolds OI v2, Bob's favourite SST, as a bonus. HadNMAT has almost the same slope as ERSST v4 going back to 1950. Reynolds is slightly less - a difference of only 0.001C/decade! In his chart above, Bob claimed (again) that HadNMAT2 was used as "the reference" for ERSST v4. It wasn't. It was used to correct bias in ship sea surface temperatures only, around 10% of the measurements over the period that Bob's plotted. The other 90% of measurements came from the more accurate buoys. 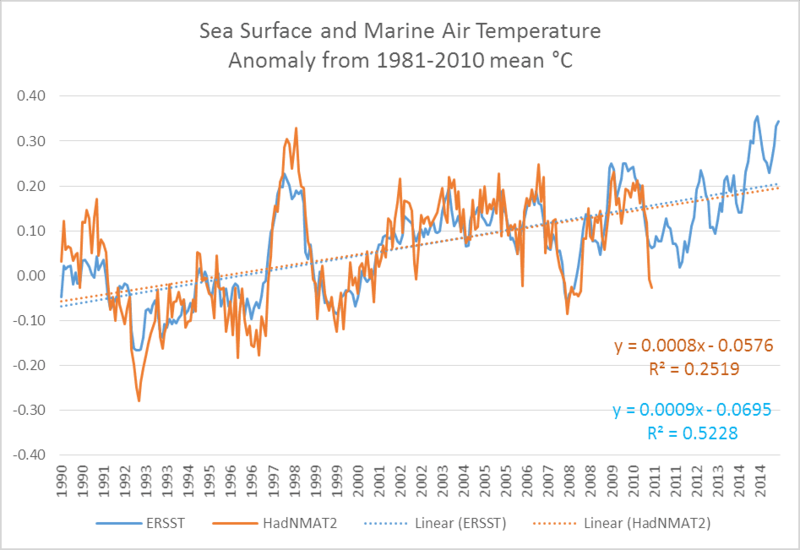 Bottom line for the NOAA adjustments: I can support with data my statements about the NOAA ERSST.v4 sea surface temperature-based global temperature products being unjustifiably overcooked. That's it. That's the sum total of Bob's rebuttal. A simplistic chart and a few words saying they are wrong. No analysis. Clearly no understanding of how HadNMAT was used or why. Nor any understanding of ERSST v4 itself. Seeing the period in question has almost no influence from HadNMAT, Bob's chart is not showing what he thinks it does. 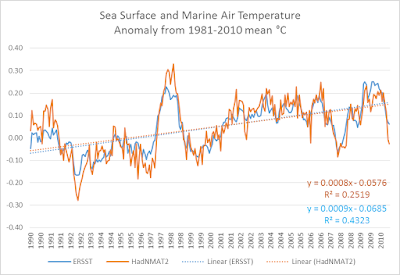 What the HadNMAT is showing is that the night time marine air temperatures as measured on ships are not inconsistent with sea surface temperatures as measured mostly by buoys in the period that Bob looked at. What is ironic is that some of the work that underpins ERSST v4 and HadNMAT was by one of the authors of Bob's favourite sea surface temperature data sets (Reynolds OI v2), Richard W Reynolds. He and Thomas M. Smith co-wrote a number of papers on sea surface temperatures. The team that developed ERSST v4 said the methodology follows that described in a 2003 paper of Smith and Reynolds. If you read any of the papers listed below, you'll quickly realise the ridiculous in Bob's weak attempt to "rebut" the scientists. Bob plonks up a five minute chart that he doesn't understand, about work that he could never hope to understand, and proclaims that the scientists are fraudulent or, in his words, their "data are unjustifiably overcooked". In stark contrast, the work by scientists is based years of work and very detailed analysis of observations taken over 150 years or more. It's far from a simple matter of plonking up a couple of charts. The scientists' work is rigorous, very complex and a galaxy away from Bob's ridiculously simplistic attempt to refute it. wickedwenchfan doesn't care about bucket materials, insulated vs not insulated, deck heights, engine room intake readings, or any of that trivial stuff that concerns scientists, all they want is the raw data. Let’s face it, data should be data. Full stop. End of story. No excuses. No adjustments. Once you adjust data, even once, for whatever reason, we are no longer doing science. We are doing opinion and personal bias. Put everything back as it was. Show on graphs where instruments changed, or where airports were built, or where orbits declined, etc, etc, but let the data speak for itself and leave everyone the opportunity to interpret it as is. "Show on graphs where instruments changed, or where airports were built, or where orbits declined, etc, etc,"
Sigh, it's called metadata and there's a whole field of study devoted to it. All wickedwenchfan would have to do is download the xml's and their questions would be answered. Tisdale v Sou, Tamino and science. Place your bets. It's inappropriate to call it a bet, methinks. I didn't say it was a fair bet. As well as doing a lot of reading on the subject, I had some help from one of the authors of the main ERSSTv4 paper. He'd rather run with his fundamental error. No way. The form guide is unequivocal. Tisdale is very fast out of the starting gate but slow into the first bend and always trips over his own legs in the straight. Hasn't finished a race yet. I think he is intimidated by scientists (and statisticians) The only way he can deal with them is via fear aggression. It didn't seem like he had actually read the ERSSTv4 documentation or the supporting documents. He would do well to learn to use Google, and to get access to the scientific journal articles he is criticizing. Bob Tisdale insists on making such a fool of himself. He has written yet another article about this, saying the same things that he said in his umpteen previous articles, including one he posted just a few hours ago. Perhaps we can call him Kenji (a dog with a bone), only Kenji is smarter. He follows science. Such a terrible cheater you are. Ask someone who has spent years or decades working on a subject about their area of expertise. Don't you know you're supposed to just make up everything? It's so trivial to show statistically that there is no difference in trends between the two data sets. Tisdale doesn't know how, and thinks that any gap between two lines is meaningful, no matter how small. That's true, CF. However IMO his biggest mistake was insisting that HadNMAT2 was "the reference" for ERSSTv4. It wasn't. It was only applied to ship data so it was important before buoys became dominant around 1980 (now 90% or so). Nick Stokes told Bob he was wrong way back when he first made that mistake. Bob refused to listen. In the period he's looking at the marine air temperatures make an interesting comparison and a useful cross-check - that's all. The impact on global mean SST in ERSSTv4 in recent periods would lie somewhere between almost zero and inconsequential. "You know nothing Bob Tisdale." CF, at least John Snow was on a journey of learning and understanding. Tisdale is about as recalcitrantly uneducable as it is possible to be and still host an operational metabolism. Curious Sou, do you have a link to your scientific background/education, i.e. CV? Her main qualification is that she is vastly admired by scientists and hated by fake skeptics. PG, thanks for responding on behalf of Sou. So, no academic CV. By the way I came across this site via Michael Mann's retweet, the persecuted victim post and read Sou's Tisdale post. Thought it might be academic but both look like on Graniudian level plodder vs plodder fare and not truly not worth reading either Tisdale or Sou's posts. Thanks, sorry better material to read out there. Better material? Fantastic! When you find it please report back. BTW don't go anywhere near WUWT. Anthony has this thing about anonymous comments. You probably won't make much headway on WUWT telling Tisdale he's a Guardian reader, Anon. But I somehow suspect you aren't as unbiased as you claim so I guess you know more about WUWT and Tisdale than you're letting on. Perhaps our Watts fanboy is trying out for a career in comedy. Anyone care to remind him of Anthony's peculiar "scientific background/education". Last I heard, its a secret. ROFL. With fans like this guy, Anthony doesn't need enemies. Millicent I am sure Anonymous has a lot to offer us. I invite him back to show us how Sou could improve on probably the finest explanation of ERSST v4 on the web. Don't be shy Anonymous. Some people wear a big sign saying "denier", in flashing lights you can spot a mile away. It's not the first time it's happened. When an anonymous poster's first comment is asking for more personal details, like Anthony Watts does (suggesting they can't find their way around a blog), you can bet they wouldn't know science if it hit them in the face. and many more in the blog roll and elsewhere. You never know. Perhaps Anonymous will thank us and come back with what they've learnt. They might even offer more links to some of the myriad sources of excellent scientific information about climate. Yes, WUWT and his dislike of "anonymous" comments. Quelle surprise. An anonymous one liner engaging in a logical fallacy. Why don't you go first with your own? Mmm, yummy word-salad, followed up by ' Thanks, sorry better material to read out there.' The Irony, it burns. BTW the correct misspelling is Grauniad. Look it up. Also "reference" does not mean what Tisdale thinks it means. The Smith and Reynolds 2002 paper describes the process in detail. As I understand it they look at gridded monthly data where there are pairs of ship SST and NMAT2 readings and map and smooth these differences over time and space. Then using the climatology of the NMAT2 readings they identify areas in time and space where the SST differences are more or less than expected, and thus identify regions of instrumental bias in ship SST readings. Then they calculate the bias adjustments to SSTs. There's nothing in this that assumes the trends in SST and NMAT are the same over time. In fact difference in trends have been widely documented; as early as 1998 John Christy of U of Alabama Huntsville showed that night marine air temperatures have a less positive trend than SST for the period studied. Alvy Singer: [the man behind him in line is talking loudly] What I wouldn't give for a large sock with horse manure in it! Alvy Singer: [to audience] Whaddya do when you get stuck in a movie line with a guy like this behind you? Man in Theatre Line: Wait a minute, why can't I give my opinion? It's a free country! Alvy Singer: He can give it... do you have to give it so loud? I mean, aren't you ashamed to pontificate like that? And the funny part of it is, Marshall McLuhan, you don't know anything about Marshall McLuhan! Man in Theatre Line: Oh, really? Well, it just so happens I teach a class at Columbia called "TV, Media and Culture." So I think my insights into Mr. McLuhan, well, have a great deal of validity! Alvy Singer: come over here for a second... tell him! Marshall McLuhan: I heard what you were saying! You know nothing of my work! You mean my whole fallacy is wrong. How you got to teach a course in anything is totally amazing! Alvy Singer: Boy, if life were only like this! Start with the comment by Richard Barraclough and meander along to admire Bob's ticks of mind-reading of the warming intent of NOAA scientists and the cooling intent of UAH scientists, and the various grammatical corrections - both ways. If you're unlucky, you'll come across unfunny Anthony Watts trying to play the class clown but looking like the class dunce. I liked Tamino's comment about Watt's smearing him for his anonymity while Tisdale repeatedly failed to respect said anonymity, which is it guys? Off Topic I see Watts has re-posted Lubos Motl's faux outrage at John Cook appropriating his (Motl's) name in some experimental closed forum, that was later made public by the ethically-challenged Brandon Shollenberger. This identity non-theft was brought to Motl's attention by Steve McIntyre. That would be the Steve McIntyre who would log onto Usenet groups discussing Michael Mann's 'hockey stick' studies under the sockpuppet 'Nigel Persuad' and post about how brilliant the McIntyre critique was, and how flawed was the work of the climate scientists …. I saw that post at WUWT, including a "nazi" reference which I could not resist commenting on. They don't let a chance go by, do they? It wasn't hard to find the truth behind the Lubos Motl "identity theft" fabricated scandal. Actually I think I even recall Skeptical Science asking for "lab rats" to participate. The conspiracy types have certainly gone into overdrive on the subject. "would you please stop posting as Lubos Motl. There is reason to doubt his sanity, so I don't like seeing his name. Further, it is his name, and therefore one you are not entitled to use." PS I have no time for Lubos Motl, he sounds like an unpleasant fellow. The SkS site was later hacked (there's a series of posts on the site about the hack, I confess I haven't read them all but it sounds like a serious attack)and the experiment details leaked. Schollenberg wasn't the hacker on this occasion,AFAIK ( though he did later leak experimental details of the '97%' paper without authorisation) but he did collate and sub-edit the material into a readable form and posted it on his website. Thus pretty much confirming Cook's result about reading comprehension. Funniest thing I've read in a long, long time. PS Motl is a genius in his field, which is string theory, but his genius sadly does not cross over into other areas of science and is combined with some severely unattractive personality traits that led to him losing his Harvard professorship and any shred of credibility. I guess Anthony needs to embrace anyone and everyone who fights the good fight, even those who talk about 'liquidating' warmists . I would like to think Anthony Watts is in trouble. He made a serious accusation and named John Cook. And he keeps saying John Cook dresses himself as a Nazi. It sure sounds like malice to me. There was a photoshopped picture of Cook in SS uniform, a joke, based on some people using SS as the abbreviation for the website. OK, not all jokes work, but once but again it was posted on a forum they had every expectation was private. He really has them rattled, to stoop to such stuff. "it was posted on a forum they had every expectation was private." Our computer systems are full of security holes. If you have well funded corporate enemies, then there is no such thing as a private forum.
" That's what happens when you don't read the literature. (Like his rival, Willis Eschenbach, thinking he was the first person to discover that thunderstorms carry heat aloft.)" Reminds me of the conversation I was having with a friend and a PhD student just yesterday. Some of her work veers off and connects with fields of psychology and medicine, areas in which she has little familiarity. She was making statements about the impacts of emotional well-being on health and diseases as if no-one had ever talked about them, and why was the establishment so intent on ignoring the emotional factors , and why did they prefer to just treat the symptom, not the cause.